Some VRC events may choose to conduct PTC Verification Testing using a PTC Authenticator to ensure compliance with Rule <R15> and help establish a fair playing field for all teams. The PTC Authenticator can be created using standard off-the-shelf VEX EDR hardware and pre-written code available for download below. Note: V5 Smart Motors handle thermal protection differently than 393 motors, and this test is not necessary for teams using the V5 control system. Download source code for your preferred programming package below. If necessary, first download and install a free software trial. 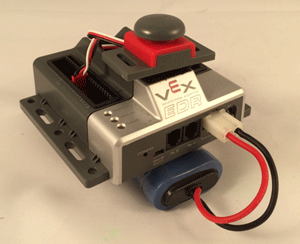 More information about VEX programming options can be found on the VEX Programming Software page. Why is PTC Verification Testing being conducted? To ensure rule compliance and a level playing field for all VRC teams. Motors are powered through an inspector's PTC Authenticator and set to run full power in one direction. These motors are loaded (manually stalled by hand) and the results are observed. The inspector will watch until the PTC cuts current to the motor and it stalls. DC motors vary in performance by +/- 10%. Is it true that if I use a “weaker” motor I will fail PTC Verification Testing? No. DC motors do vary by +/- 10%, but this variance WILL NOT cause a failure in the test. Is it possible, in ANY way, to have a “false positive” test? No. Our testing using this procedure at the 2014 VRC World Championship proved to be 100% accurate and conclusive and all of our internal testing and data (before and since) has been 100% accurate and conclusive as well. There are no “false positives” using this test. How does PTC Verification testing affect robot motors? Based on extensive in-house testing and discussions with the PTC manufacturer, the PTCs in the motor will return to high levels (95%) of performance within 15-20 minutes of being tested. They will be "as good as new" within one hour after a test. Inspectors will do their best to keep this impact to a minimum and fair to all teams at an event. I’ve heard the more you trip the PTC, the worse your motors will get over time. Does PTC Verification Testing Cause any lasting or permanent damage to robot motors? No. Based on all our testing of the PTCs and discussions with the manufacturer, we have no reason to believe that this is true. As described above, the motors suffer short-term impact from the testing, but over time they are as good as new.